Wall murals /Super Graphics: are large, scenic graphics applied to the wall much like wallpaper with 1 to 5 years warranty. 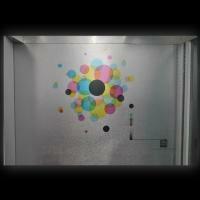 - Glass Graphics (Frosted / Dusted /Printed /Vinyl Cutouts). These elements should be a reflection of your branding strategy, and a company rallying cry. It’s the flag everyone salutes. Count on Inzynix to put your image up front and centre. Flawlessly. 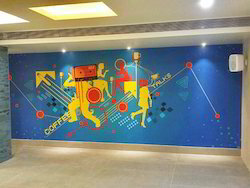 We are offering Wall Graphic to our client.